At its height, Polish businesses lined Broadway from Smith Street east to the city line. Bars, restaurants, cigar shops, clothiers, appliance stores, pharmacies, bakeries, and butcher shops are but a few of the stores found along the street. Of all these businesses, the only one able to expand on a national level was Spolka Clothing at 1058 Broadway. 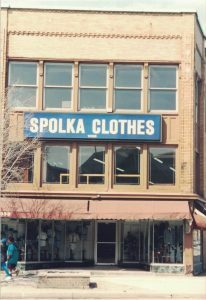 Spolka Clothing began its life as the Polska Spolka Akcyjna in late 1906. The genesis of the firm was to create a locally owned, locally operated store whose profits would stay in Polonia. To achieve this, Joseph Nowacki, Wawrzyn Winiewicz, and Andrew Nowacki sold shares in the company and hired tailor Alexander Szczukowski to run operations. On April 27, 1907, a grand opening of the store was at 1042-1044 Broadway. It didn’t take long for Szczukowski to make Spolka a success. He did this by creating quality clothing for men and boys that was affordable for his labor class customers. The wares flew off the shelf and within 10 years, a larger store was needed. In 1918, architect George J. Dietel designed the two- story brick building for the firm’s new headquarters at 1058 Broadway. From this flagship store, Alexander began to expand the reach of the company from across the city, to the region, and beyond. One of the first locations Szczukowski expanded to was on 1307 East Falls Street in Niagara Falls in the epicenter of that city’s Polonia. In Wilkes-Barre, Pennsylvania he set up a store at 62 South Main Street in the downtown. Back in Buffalo, a store was opened at 436 Amherst Street in the Black Rock neighborhood and another would be tried in Binghamton, New York. 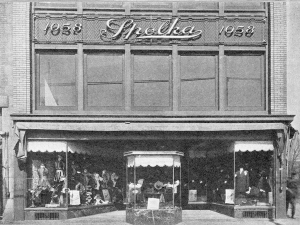 Spolka even opened a store in America’s fourth largest city at the time Detroit, Michigan, near St. Hedwig Catholic Church. Some locations were more successful than others, with the ones in Buffalo lasting the longest. Alexander passed away in January of 1950, and in his place, his son Louis took over. Louis grew up in the company and by the Second World War, Louis was the store manager at the Broadway location. The company saw good times from the 1940s straight through the ‘60s. Things began to turn and by the early ‘70s every Spolka store had closed except 1058. In 1972, Louis retired and like a generation earlier, his son, Louis Jr. took over the family business. Where his grandfather oversaw great expansion, and his father experienced the golden age of the East Side, Louis Szczukowski Jr. saw the contraction of the Polish neighborhood. Many of Louis’s customers, whose fathers and grandfathers had purchased suits, coats, hats, and accessories at the store, began to frequent the suburban malls. Although the declining business didn’t deter Szczukowski from coming in to work every day, declining health did. On November 21, 2000, Spolka held one last sale and closed its doors. The building and remaining inventory was sold off and 100 minor shareholders of Polska Spolka Akcyjna received their last dividend. "Buffalo." American Hatter Mar. 1916: 103. Print. "Buffalo N. Y. - The Polish Stock Company." Men's Wear 8 Mar. 1907: 118. Print. "Building Plans For Week Total $66,608." Buffalo Evening News [Buffalo, New York] 4 Mar. 1918: 19. Print. Clinton Brown Company Architecture. City of Buffalo Intensive Level Historic Resources Survey: Broadway-Fillmore Neighborhood. Rep. Buffalo, New York: 106, 2004. Print. Fronczak, Francis Eustace, Aleksander Pitass, and Mieczysław Haiman. "Ci, Którzy Do Pomogli Do Wydania Księgi Jubileuszowej - Wladyslaw H. Zawadzki." Księga Pamiątkowa Złotego Jubileuszu Osady Polskiej I Parafji Św. Stanisława, B. I M. W Buffalo, New York, 1873-1923. [Buffalo, N.Y.]: Nakładem Komitetu Wydawniczego, 1923. 286-287. Print. Kaszubik, Keith A. "Buffalo's Historic Spolka Clothing Sold After 110 Years of Service." Polish-American Journal [Boston, New York] Jan. 2001: n. pag. Print. "Louis S. Szczukowski, Men's Store President." The Buffalo News [Buffalo, New York] 26 Oct. 2000: n. pag. Print. Meyer, Brian. "The Final Sale ; Spolka Clothing's Closing Shows Need To Plan." The Buffalo News [Buffalo, New York] 20 Nov. 2000: n. pag. Print. Spolka. Ink Blotter. Print. Includes Detroit Address.